"eCleaner (Forget Button)" is a browser extension to quickly wipe browser footprints from an specified time. Using this extension you can clean your fingerprints with just once clean. The extension supports almost all possible cleanings such as cache, history, cookies, and so on. What is "eCleaner (Forget Button)" extension and how does it work? "eCleaner (Forget Button)" extension allows you to clean all traces that browser might store during the session based on time frame that you request. This extension is like a forget button. Note that it is even possible to wipe all the stored data for all time, however, use this option with caution. There are some sensitive areas that you probably don't want to wipe data from. The extension is going to warn you and ask for confirmation before allowing you to wipe data from sensitive areas. I am using eCleaner for cleaning one type of resources a lot. Can I have a one button cleaner tool instead? Each tool has a toolbar button for quickly erase that particular type of resource from your browser. Note that by default only data that is stored in the last 7 days is wiped out. You can define a custom time period for cleaning task in the options page. Also the default cleaning zone is "normal browsing" zone; this option is also adjustable in the options page. What type of fingerprints this extension can wipe? 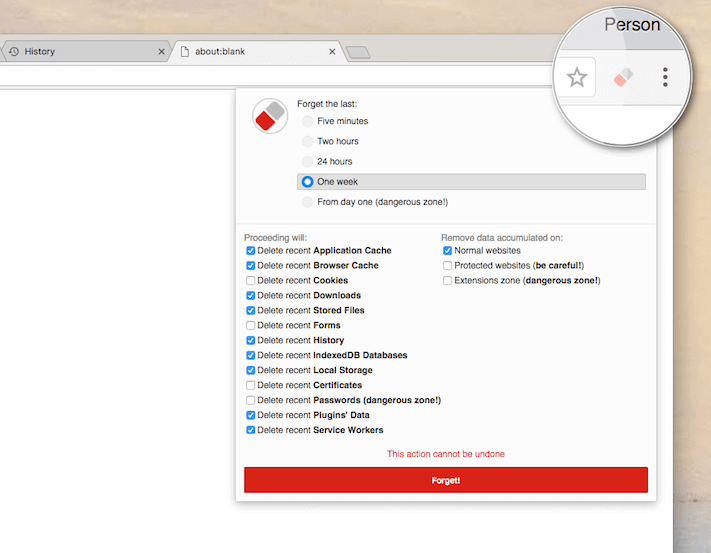 The extension allows you to delete all possible types of data that browser can store ranging from application cache to even databases such as IndexDB. It is even possible to delete recently stored passwords using this extension. Upon opening the panel, a few types are selected by default. These are most likely the sort of data types that you want to clean. Why are there different zones in the extension and what is the meaning of each zone? Normal website zone: a place where normal websites store different type of data in. Protected website zone: a place where websites that have been installed as hosted applications store different type of data in. Extensions zone: A place where installed extensions and packaged application store data in. It is very unlikely that you will need to wipe data from this area. Use this option with extra caution. This is for your own protection. By default all the harmless items are selected. Can I perform automated cleaning when browser is about to exit? Yes, as of version 0.1.5, it is now possible to define customizable cleaning job when all browser windows are exited. To set a new job, open the popup and define the settings. Now press on the "Clean on Exit" button. This will set an automated job for you that will be performed on browser exit (when there is no open window). To cancel this automated job, go to the settings page and disable this action.